Click a node to read about it. 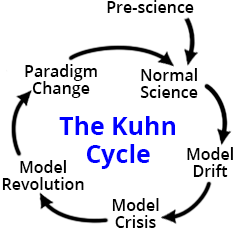 The Kuhn Cycle is a simple cycle of progress described by Thomas Kuhn in 1962 in his seminal work The Structure of Scientific Revolutions. In Structure Kuhn challenged the world's current conception of science, which was that it was a steady progression of the accumulation of new ideas. In a brilliant series of reviews of past major scientific advances, Kuhn showed this viewpoint was wrong. 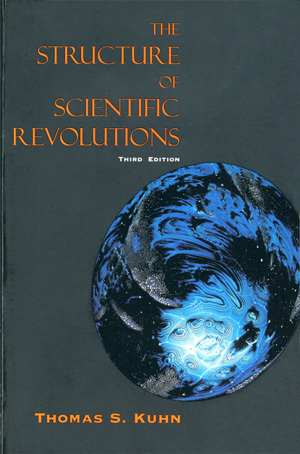 Science advanced the most by occasional revolutionary explosions of new knowledge, each revolution triggered by introduction of new ways of thought so large they must be called new paradigms. From Kuhn's work came the popular use of terms like "paradigm," "paradigm shift," and "paradigm change." 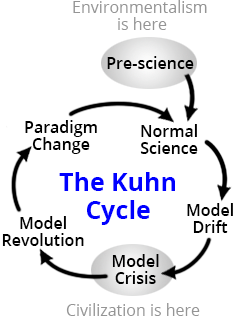 The Kuhn Cycle is preceded by the Pre-science step. After that the cycle consists of the five steps as shown. The Model Drift step was added to clarify the cycle and allow reuse of the Model Drift concept in the System Improvement Process. Punctuated equilibrium is commonly contrasted against the theory of phyletic gradualism, which states that evolution generally occurs uniformly and by the steady and gradual transformation of whole lineages (called anagenesis). In this view, evolution is seen as generally smooth and continuous. 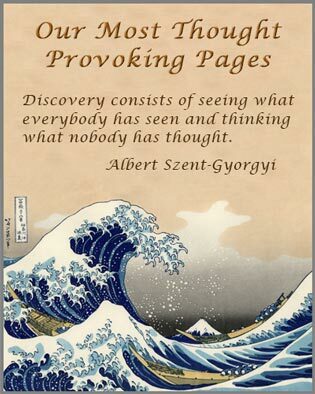 What is to be observed and scrutinized. The kind of questions that are supposed to be asked and probed for answers in relation to this subject. How these questions are to be structured. How the results of scientific investigations should be interpreted. The global environmental sustainability problem is so large, complex, novel, urgent, and its solution so difficult that solving the problem entails creation of a new paradigm. Just conceiving of the problem requires a fundamentally new way of thinking. Before The Limits to Growth defined the problem in 1972, there was little realization that human system growth could not be infinite. So called "progress" cannot go on forever. The environment cannot be tamed and subjugated, as mankind has done before to everything else that stood in the way of "progress." Environmentalism finds itself in the Pre-science step of the Kuhn Cycle. It lacks a valid paradigm for solving its central problem of sustainability. Yet the field's members are assuming they are in the Normal Science step, where a field has a paradigm that works well enough for that field to be called a bona fide science. This is a grave error. Civilization as a whole is in the Model Crisis step. The model it uses to run itself, mostly free market democracy, a collection of national governments, and some central coordination like the UN and the World Bank, is no longer capable of solving the world's top problems. The model was good enough to navigate through the Industrial Revolution, two world wars, the Great Depression, the Cold War, and other problems. The model shows no sign of being able to solve the global sustainability problem. Because of this void modern environmentalism appeared to fill the gap, beginning with Silent Spring in 1962. But the gap is large and difficult. The new field has so far been unable to provide a new model, a new paradigm, capable of solving the sustainability problem. 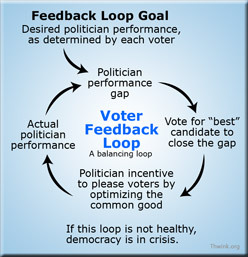 The top problem to solve is thus not the sustainability problem itself, but finding the new paradigm needed to solve it. Environmentalism and civilization may not know it but they are both in search of a paradigm that works. All new fields begin in Pre-science, where they have begun to focus on a problem area but are not yet capable of solving it or making major advances. Efforts to provide a model of understanding that works eventually bear fruit. The field can at last make major progress on its central problems. This puts the field in the Normal Science step where it tends to stay longer than any other step. Over time the field digs so deep into its area of interest it discovers new questions its current model of understanding cannot answer. As more of these anomalies ("violations of expectations") appear the model grows weaker. This is the Model Drift step. If enough unsolved anomalies appear and the model cannot be patched up to explain them, the Model Crisis step is reached. Here the model is obviously no longer capable of solving the field's current problems of interest. It's a crisis because decisions can no longer be made rationally. Guesswork and intuition must be used instead. These tend to fail. Finally out of the struggle to form a new model of understanding one or more viable candidates emerge. This begins the Model Revolution step. It's a revolution because the new model is a new paradigm. It's radically different from the old paradigm, so different the two are incommensurate. Each uses its own rules to judge the other. Thus believers in each paradigm cannot communicate well. This causes paradigm change resistance. Once a single new paradigm is settled on by a few influential supporters, the Paradigm Change step begins. Here the field transitions from the old to the new paradigm while improving the new paradigm to maturity. Eventually the old paradigm is sufficiently replaced and becomes the field's new Normal Science. The cycle then begins all over again, because our knowledge about the world is never complete. 0. Pre-science - The field has no workable paradigm to successfully guide its work. 1. Normal Science - The normal step, where the field has a scientifically based model of understanding (a paradigm) that works. 2. Model Drift - The model of understanding starts to drift, due to accumulation of anomalies, phenomenon the model cannot explain. 3. Model Crisis - The Model Drift becomes so excessive the model is broken. It can no longer serve as a reliable guide to problem solving. Attempts to patch the model up to make it work fail. The field is in anguish. 4. Model Revolution - This begins when serious candidates for a new model emerge. It's a revolution because the new model is so radically different from the old one. 5. Paradigm Change - A single new paradigm emerges and the field changes from the old to the new paradigm. When this step ends the new paradigm becomes the new Normal Science and the Kuhn Cycle is complete. The Wikipedia entry for the book. From Emory University we have Professor Frank Pagares' Outline and Study Guide. This is a selection on a page about Thomas Kuhn, with additional links at the bottom. Lecture notes on Paradigms and Normal Science.